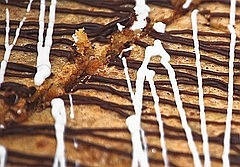 If you like toffee, you will love my toffee bar recipes. Whip up a batch and taste for yourself - they like Grandma's. PREHEAT oven to 350 degrees. Lightly grease 8x8 inch pan. Cream together and add 1 cup flour. Mix together and pat into the greased pan. Bake for 10 minutes and then cool. Beat the eggs until light. Add the brown sugar and vanilla. Sift the flour, baking powder and salt together and add to the brown sugar mixture. Add the coconut and nuts. Spread over the bottom layer and bake for 25 minutes. Drizzle the top with dark and white chocolate if you wish. Thoroughly cream the butter, sugar and vanilla together. Add flour and mix well. Stir in the chips and walnuts. Press into a 10x15 inch jelly roll pan. Bake for 25 minutes, or until browned. Cut into squares while still warm. Cool before removing from pan. Makes approximately 5 dozen bars.